If you’ve ever successfully decluttered your home, you might have been disappointed that it didn’t stay decluttered forever. The fact is that we are constantly bringing things into our homes and we rarely take anything out. 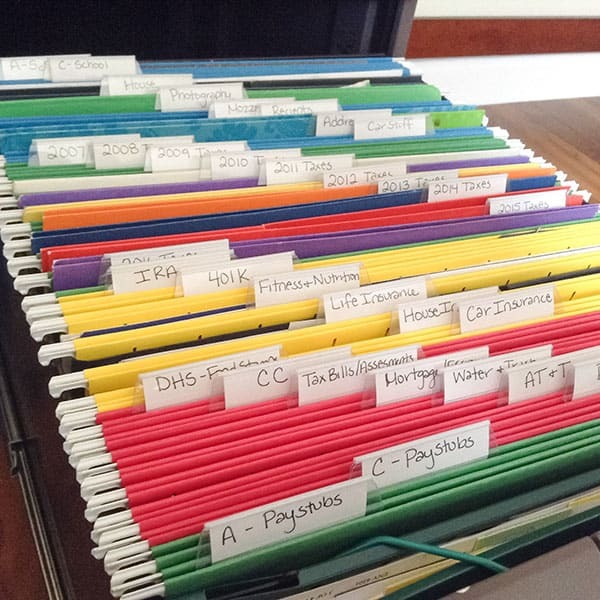 Even though I’m very diligent about not bringing in excess stuff, clothes and shoes wear out or don’t fit anymore, we need new tools for a project, we receive gifts, the mail comes, we keep adding paperwork to the filing cabinet… It all adds up. Quickly. I find it easier to figure out a maintenance routine for keeping up with clutter. If I just ignore it until it gets bad, I’ve got a huge, overwhelming project on my hands. 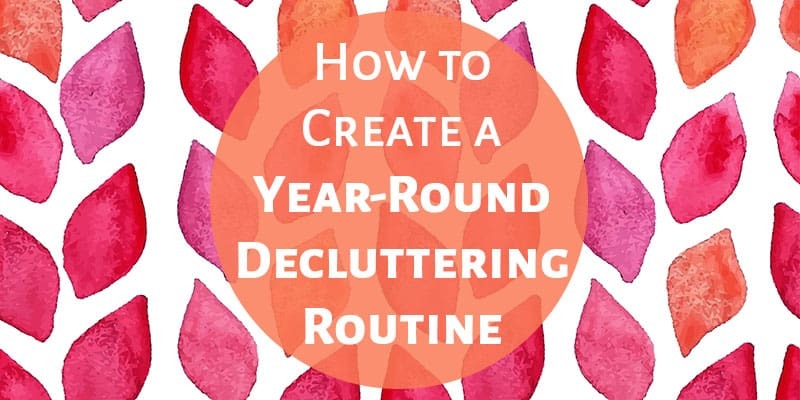 I’m going to share my year-round routine for keeping up with clutter. I hope you’ll be able to adapt certain parts of it to work for you. I honestly never set out to create a decluttering routine. It has kind of just evolved over the years into what it is. It all makes sense and easily works for us. I like to go through most of the house twice a year. It usually end up being in the spring and fall and here’s why: In the spring, I pay special attention to clothing and items used in fall and winter (the cold months). If we didn’t wear some of our warm clothes and boots in the last six months (the prime time to wear such things) we probably don’t need them. In the fall, I pay special attention to spring and summer stuff for the same reason. If your house feels overrun by toys, The Toy Detox is the course I recommend to everyone. Denaye is a parent and also has a Ph.D. in child development, so she’s the perfect person to help. Her course has so much valuable information in it, like how to choose which toys to keep and how to get your well-meaning family and friends on board. Click here to take a look at The Toy Detox. I also quickly go through the kitchen, bathroom, and books to see if there are things we don’t need anymore. It may sound like a huge job but it’s not bad at all. I just look for things that don’t fit, are worn out, or that didn’t get used in the last six months. Throughout the rest of the year, I keep a tub or crate of things to get rid of. Whenever something doesn’t fit anymore or I notice we don’t need it, I simply put it in the tub. When the tub gets full, I take it someplace to donate (or pick out a few things worth selling). If I’m not sure about getting rid of something, I’ll place it in the tub and see if I end up wanting it over the next few weeks. If I want or need it, I’ll grab it back out but that honestly hardly ever happens. Sometimes a certain area will get out of hand in between the big purges and needs to be dealt with. If I can’t seem to keep an area of our home picked up, I assume it’s because there’s too much stuff. I’ll tackle small projects here and there as needed through the year. Right now it’s our office. It’s looking crazy in there, so I’ll spend a few hours decluttering and organizing soon. Other small areas might be the garage, your storage tubs, the bathroom, or kids’ toys. 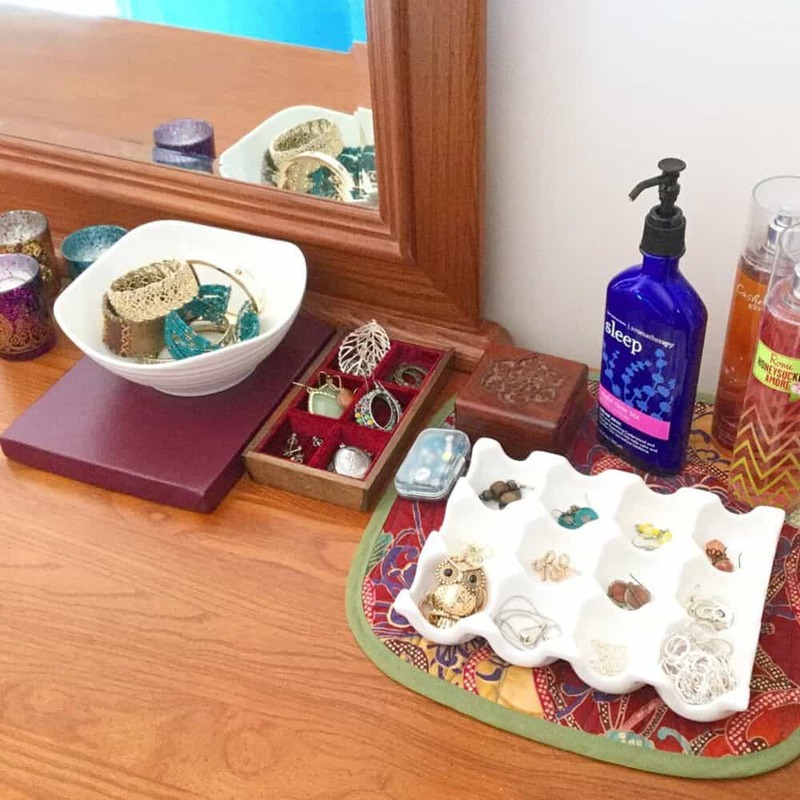 Creating a decluttering routine has been so helpful in maintaining order in our home throughout the year. It’s not too hard to spend a few hours here and there to stay on top of things. It’s when procrastinate that things get completely out of hand it and it turns into a huge, time consuming, and overwhelming project. Make Money from Your Decluttered Items! With Decluttr.com, you can easily sell your old cell phones, DVDs, CDs, video games, video game consoles, tablets, ereaders, and other tech. Decluttr (It’s not spelled wrong, I promise!) will tell you how much they’ll pay for each item and give you a prepaid shipping label. They’ll pay you the day after they receive your stuff! We’ve found that it’s a quick and easy way to make money from decluttered items. 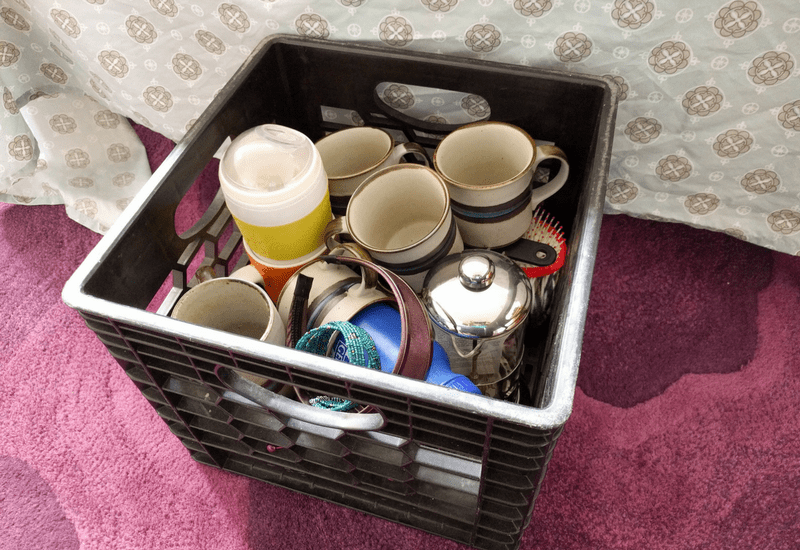 ⇒ Do you have a decluttering routine? Let me know in the comments! Start The 4-Day Declutter Challenge! Delivered straight to your email with homework (and extra credit) for each day. Wonderful! Now just check your email to get started with the challenge!